Few people would claim they enjoy working trade shows. The floors are hard. The days are long. Sometimes shows are simply boring with long lulls between visits to your booth and then, often, it’s another vendor who is equally bored who stops by to kill time. As day three of the RFID Journal Live conference wrapped up, I would readily admit that my back was sore and I was tired but I was never bored. For us, this show was extremely interesting – even invigorating. The attendees at the show were friendly and gregarious and seemed genuinely interested in talking to us and other vendors about their business challenges and the problems they were trying to solve. Intelleflex has changed a lot between last year’s RFID Journal Live and this year’s conference. In the past twelve months we’ve relaunched the company with a focus on solutions for the cold chain, asset tracking and personnel monitoring. We’ve introduced a new family of products based on the Class 3 battery-assisted passive standard that represents a new approach to RFID. 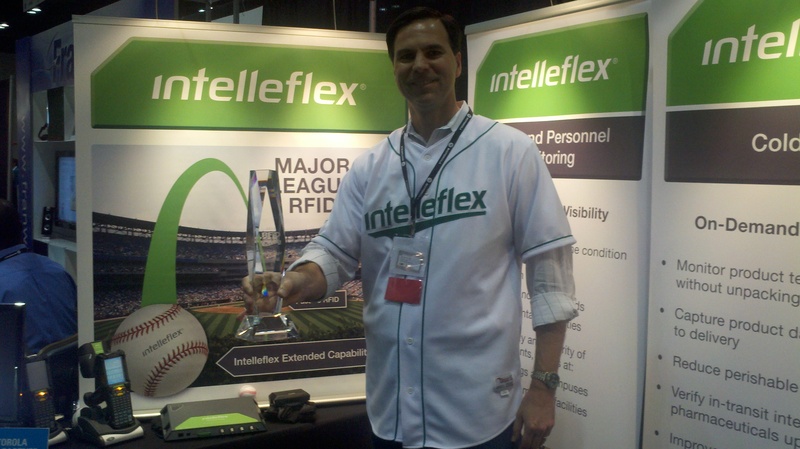 So, it was extremely exciting for Intelleflex to be named the “Best in Show” winner at this year’s conference. It was great to put faces with the names of so many people that I’ve spoken to or corresponded with and meet people from around the globe. I’ll have to admit that, while I seldom look forward to working trade shows, RFID Journal Live 2012 is one that I’ll be looking forward to. I’d enjoy hearing your thoughts on the show. This entry was posted in RFID News, RFID Tags. Bookmark the permalink.